The all-new Mazda6 went on sale on 25 January, and all UK Mazda dealers have demonstrators. Mazda is hoping to attract an estimated 300,000 Mazda 6 drivers back to Maza showrooms to try the new car. "We have a huge database of Mazda6 owners, with more than 100,000 sold in the UK and an estimated 300,000 people out there who have owned one," explained Mazda Motors UK Sales Director Peter Allibon. "Launching in January means we hit the March sales peak and we anticipate that if we do the job right we will sell 3,000 cars by the end of March and 7,500 in a full year." Nevertheless, the showroom action began well before January with the first all-new Mazda6 Tourers arriving in the second week of December. "The Saloon arrived last month giving dealers the opportunity to have two launches for the car, such as an unveil for the Tourer followed by a customer test drive weekend for both models," said Allibon. "The dealers reaction to the all-new Mazda6 has been overwhelming," he added. Allibon is forecasting a sales split 65-35 in favour of the Saloon. Sales of the previous generation Mazda6 were split fairly evenly between private and business customers. However the all-new Mazda6, which has class-leading CO2 emissions from just 108g/km, is expected to be even more tempting for business drivers. 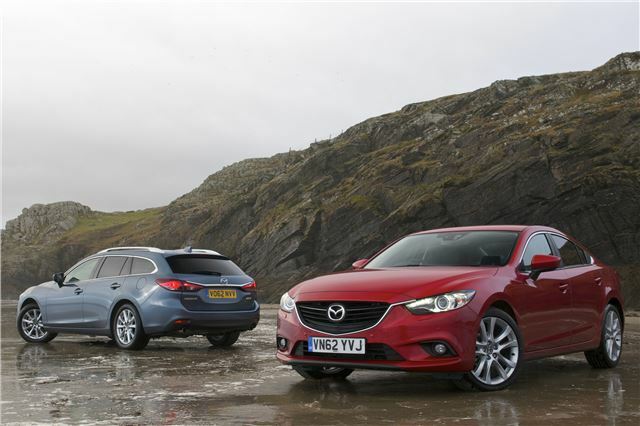 "Historically, Mazda6 has not been a rep's car, so there's no stigma attached to it. With the Mazda6, owners can be individual because BMW and Audi are the new volume players in this segment of the fleet market," said Allibon. Mazda6 goes on sale priced from £19,595 to £28,045 (on the road). The 150ps 2.2-litre SKYACTIV-D has class-leading CO2 emissions of just 108g/km and 67.3mpg (combined cycle). BIK for a 40 percent tax payer is £127 a month (Sport trim). We take delivery for a log-term test later this month.